Black & White photo #8: It's windy in Norfolk! It does always seem to be windy in Norfolk, so now when my parents say it's been windy that translates to it's been more windy than normal - they've been living there for ten years now, so have clearly acclimatised! 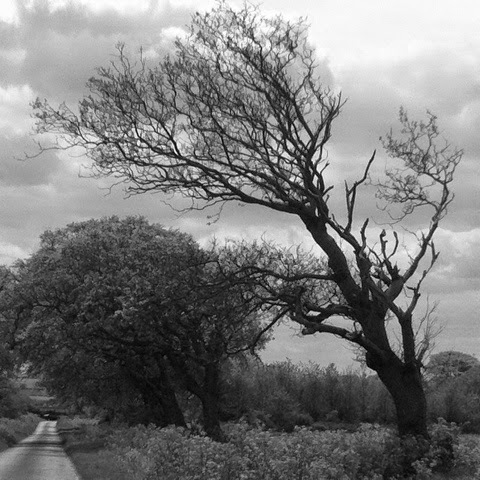 For me, this photo sums the Norfolk countryside up - beautiful and just a little bit windswept! The tree at the forefront of the picture is clearly in a windy spot and has just decided to go with the flow ...or should that be blow? I'm linking up to the Black & White photo project with Charly over at PODCast so if you pop over there you'll find more black and white shots.